Vivian ‘Viv’ Woodward was the Spurs Chelsea and England centre-forward and captain in an era when England were the undisputed World Champions, even if there wasn’t a World Cup to prove it. He was an excellent dribbler with a lethal shot and was equally good with his head, and it was no surprise that he was England’s most prolific marksman from the birth of international football in 1872 until well after World War II. In the first two decades of the twentieth century football was still finding its feet in the world at large as a regulated sport, and the only international matches that England played were against the ‘Home Countries’ of Scotland, Wales and Ireland. Matches against those countries formed the annual British Home Championship, and matches weren't played against teams from outside the British Isles until the European Tours of 1908 and 1909, when Woodward captained the team and scored many of their goals. Woodward’s England career is made more complex by the distinction that existed then between amateur and professional players. The first few decades of football in the United Kingdom had been dominated by amateur ‘gentlemen’ clubs and then the public school’s ‘old boys’ teams, but professionals began to emerge, first in Scotland, then the north of England, and had begun to take over. But there were still a large number of amateurs playing and because they were beginning to find it hard to compete for places in the English national side, the England Amateur team was formed in 1900, and Woodward, who remained an amateur for all his life, played for and captained that team too. Sticking with the official team for the moment, Woodward was first selected to play for England in February 1903 against Ireland and scored two goals in a 4-0 win. This being before the time when goal difference was taken into account, England were joint winners of the Championship that year, along with Scotland and Ireland, with Wales coming second and last! He became a fixture in the team and played in most matches in the Home Championship for the next few years, but of course that meant only playing in three international matches each year. So Woodward started playing for the amateur side as well, making his debut against France in a 15-0 win in Paris, scoring four (or seven, or even eight depending on the source!). In April of 1908, Woodward took part in the inaugural Olympic Football tournament (there had been unofficial demonstration tournaments in the previous tournaments). The England Amateur squad entered against teams from Sweden, Denmark, France (who fielded ‘A’ and ‘B’ teams) and the Netherlands. There were wide differences in class across the competitors, demonstrated by scorelines such as Denmark: 17 (Nielsen 10! ), France ‘A’: 1. Playing as Great Britain, the side showed great discipline, winning the final 2-0 against Denmark and only letting one goal in during the whole tournament. Back to the official England side and Woodward had been appointed captain for the Home Championship of 1908, which England and Scotland won jointly, and it was he who led the team on their first excursion outside the British Isles in the summer of that year. He scored one goal in the 6-1 defeat of Austria, and four goals in the return match a few days later, when the score was 11-1. They went on to beat Hungary 7-0, with Woodward getting one of those, and Bohemia 4-0 before going home. This tour was considered very successful so the following year they went again, playing two games against Hungary, winning 4-2 and 8-2, and one against Austria, 8-1, with Woodward scoring fifteen goals over the whole tour. In 1912, wearing his other hat, Woodward was off to Sweden with the amateurs to successfully defend their Olympic crown. The event had grown in stature with eleven teams competing this time, albeit all from Europe. The final came down to a repeat of the 1908 games and, according to reports at the time, was a much closer match than indicated by the score of 4-2. 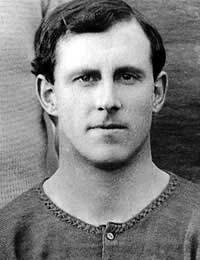 Woodward scored one of the goals in the final and was captain for the tournament (some sources say that he also captained the 1908 side but others indicate it was Frederick Chapman). Viv Woodward’s last game for the FA’s England side, his 23rd cap, was against Wales 1911 when he bagged two of the goals in a three-nil win. This took his tally of international goals to 29, which was a world record until the following year when it was broken by the Hungarian, Imre Schlosser. It remained an English record until Tom Finney surpassed it against Northern Ireland in 1958, and even today, Woodward appears at eighth in the list of England’s top goalscorers. Woodward, as with many other football players, joined up at the start of World War I and although he survived, was injured and unable to play football again. But he stayed in the game, becoming a key supporter behind the scenes of the game as it developed into the twentieth century, in particular as a Chelsea director from 1922 to 1930.